“There is absolutely no evidence; no case for him to answer to,” said Magistrate Judy Latchman before discharging Regan Rodrigues again for the murder of political activist, Courtney Crum-Ewing. It was an emotional moment for Rodrigues, also known as ‘Grey Boy’. The 33-year-old man dropped to his knees and cried when Magistrate Latchman told him he was free to go. “Freedom, Freedom,” he was heard shouting while sitting in the Police Outpost at the Georgetown Magistrates’ Courts. The Preliminary Inquiry into the matter concluded yesterday during which Magistrate Latchman ruled that a prima facie case was not made out against Rodrigues at the close of the prosecution’s case. Attorney-at-Law Nigel Hughes represented the prosecution. Crum –Ewing died as a result of haemorrhage and shock due to multiple gunshot wounds. This was supported by the evidence of Government Pathologist Dr. Nehaul Singh who testified that Crum-Ewing received five gunshot wounds– one of which was at close range. Magistrate Latchman handed down her ruling in a packed courtroom. The spectators included the parents of Crum-Ewing. “There is no evidence; absolutely no evidence…,” Magistrate Latchman noted during which Crum-Ewing’s mother expressed her disappointment by walking out of the courtroom. Prior to the Magistrate’s ruling, Assistant Superintendent of Police (ASP) Mitchell Caesar, who is the head of the Major Crimes Investigation Unit, was called to testify. On May 26, Magistrate Latchman had warned Prosecutor Hughes that he would have to close his case on the next occasion (yesterday). This was because of the continuous absence of ASP Caesar. ASP Caesar was absent on at least four occasions May 3, May 11, May 17 and May 25. He was said to be out of the country in one instance. At an April 26 court hearing ASP Caesar refused to continue testifying in the Preliminary Inquiry after Rodrigues hurled a series of derogatory remarks at him. ASP Caesar subsequently told Magistrate Judy Latchman that he would not tolerate being disrespected by Rodrigues, and left the witness box. Magistrate Latchman instructed ASP Caesar to step outside the courtroom while she and other police ranks and even the prosecutor tried to compose an outraged Rodrigues. Magistrate Latchman rebuked ASP Caesar for disobeying her instructions to not leave the court compound, given the fact that he is a senior police officer. Yesterday, Caesar recounted a confrontation that was held between himself, Rodrigues and Inspector Singh at the Criminal Investigation Department (CID) Headquarters, Eve Leary, Georgetown. Prosecutor Hughes then requested the court to make a ruling on all oral statements. Rodrigues was discharged in January on this same murder charge by Magistrate Latchman. During her ruling back then, Magistrate Latchman discharged the murder charge against Rodrigues citing insufficient evidence. Magistrate Latchman had pointed out that one of the court’s reasons for discharging the matter was because there was no evidence to support that the firearm tendered during the preliminary inquiry was used by Rodrigues to kill the political activist, although she believed the gun, a .32 revolver, was confiscated by police during a raid at Rodrigues’s home. The prosecution’s inability to make out a prima facie was once again highlighted when the Magistrate disclosed that the prosecutor failed to request the court to rule on the admissibility of caution statements allegedly made by Rodrigues. 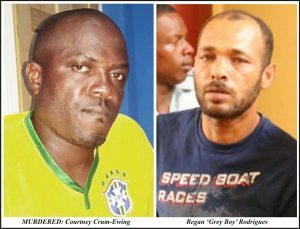 While stating that several inferences can be drawn from those statements, Magistrate Latchman underscored that they did not implicate Rodrigues in the murder of Crum-Ewing. The bullet-riddled body of Crum-Ewing was found at Third Avenue, Diamond New Scheme East Bank Demerara on March 10, 2015. The 40-year-old was shot twice to the temple, once to the back of the head and twice to the stomach. The police in a statement had said that the political activist was accosted by four men in a car, one of whom discharged several rounds, hitting him about the body. It was reported that the killer(s) used a .32 pistol to execute Crum-Ewing. The political activist was well known for his one-man protest outside the office of former Attorney General (AG) Anil Nandlall. Minutes before he was gunned down, he was reportedly heard via bullhorn urging residents of the nieghbourhood to vote against then ruling party PPP/C. On January 11, 2016 Rodrigues was jailed for three years by Magistrate Fabayo Azore after he was found guilty on a charge of escaping from lawful custody. On July 13, 2015 at River View Ruimveldt, while in the custody of a police constable pending charges for unlawful possession of a firearm and ammunition, he escaped. According to facts presented in court, on the day in question, police performing raid exercise went to the home of Rodrigues. At the time, he was at home and permitted the police to search the premises. A gun was found under a chair in the home. As a result, Rodrigues was arrested by lawmen. While being escorted to the police station, he pushed the arresting officer down and made good his escape. Police saw him the following day in the vicinity of the CID Headquarters and arrested him. Rodrigues was also charged for possession of illegal firearm and ammunition. But the charges were dismissed against him by Magistrate Azore due to insufficient evidence.